The culmination of the 2016 Lost Ark Battle Circuit: The Lost Ark Cup! This final event will be held Feburary 4th (Saturday) in the Eillott University Center of the UNC-Greensboro Campus [Alexander Room]. Paid parking is available in the adjacent deck. Super Street Fighter II Turbo at noon. Street Fighter V at 6:00pm. This event is open to everyone and all are encouraged to attend and spectate. There will be set-ups for casual play throughout the day. 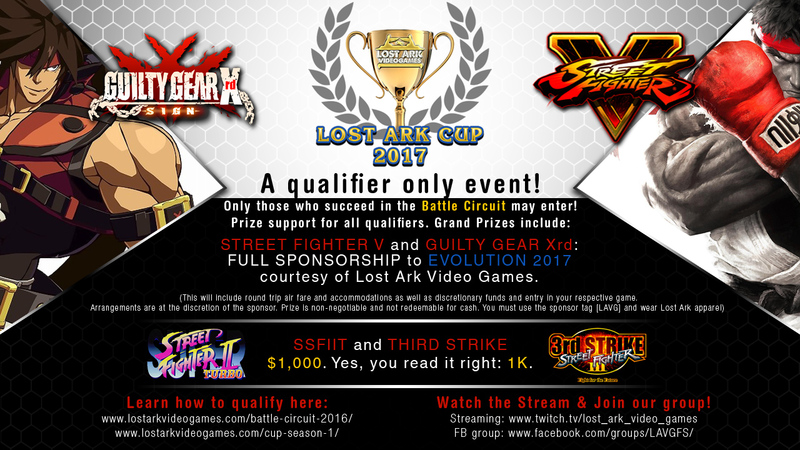 As an additional reward for the cup winners, this event will be an auto-qualifier for the 2018 Lost Ark Cup for Street Fighter V.
The format for each game will be double elimination bracket; 2/3 games until finals, which are 3/5 games. The platform for play will be Japanese arcade cabinets for SSFIIT and SFIII:3S; Playstation 4 for GGXrd and SFV. Match interruption will result in forfeiture of the match; any issues that arise will be resolved as per Tournament Organizer’s discretion. Double Blind Selection: Either player must explicitly ask for the Double Blind Selection method before either player chooses a character. When a player requests Double Blind, that players decides which characters and modes they will choose and whispers the selection to the Tournament Organizer. The Tournament Organizer then signals the players to pick characters and play modes. Once the players are finished, the Tournament Organizer makes sure the players have confirmed their original choices. Any equipment malfunction must be reported to the Tournament Organizer immediately. Collusion of any kind is considered cheating. If the Tournament Organizer determines that any competitor is colluding to manipulate the results or intentionally underperforming, the collaborating players may be immediately disqualified. This determination is to be made at the sole discretion of the Tournament Organizer. Anyone disqualified in this manner forfeits all rights to any titles or prizes he or she might have otherwise earned for that tournament. Gambling of any kind is prohibited. Winners will be responsible for all taxes (including but not limited to federal, state, local and/or income) on any Prize won and will be required to provide his/her Social Security number for tax reporting purposes if the retail value of the prize being awarded is $600.00 or greater (at issuer’s discretion sole discretion). Lost Ark Video Games, as the case may be, will file an IRS Form 1099 with the Internal Revenue Service for the prize if the retail value of such prize is $600.00 or greater. Refusal of a Winner to provide a Social Security number for issuance of an IRS Form 1099 will result in the Winner forfeiting the Prize(s). 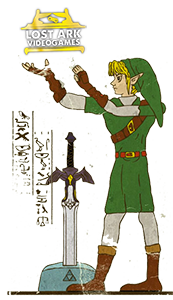 Lost Ark Video Games, as the case may be, shall comply with all IRS withholding requirements applicable to Prizes awarded to non-U.S. residents at the time the Prizes are awarded. All decisions of the Tournament are final; any exceptions are at the discression of the Tournament Organizer.